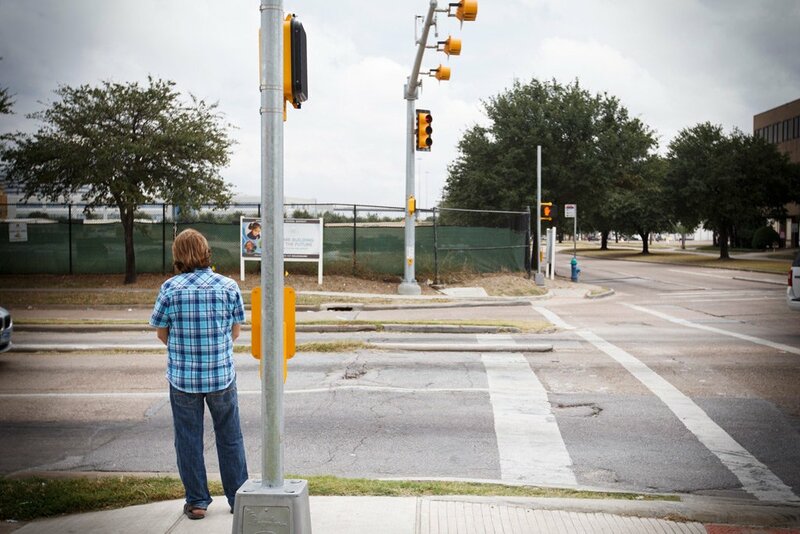 One year ago today, Spencer Golvach waited for the green light at a Houston intersection. An undocumented Mexican national pulled up next to him, pointed a pistol at Golvach’s head and pulled the trigger. The killing ignited a political firestorm. HOUSTON — Julie Golvach remembers that something felt “off” the night she lost her only child. It was exactly one year ago today, a few minutes before 1 a.m. Standing in the driveway of her Houston home, waving goodbye to her sister under a clear winter sky, something didn't feel right. The stars didn’t look the same. Golvach tossed and turned in bed for a while but was sound asleep when a knock on the door came at 6 a.m.
“I jumped up and I knew,” she said. She stopped by her son’s boyhood bedroom, the one with the window looking out onto the driveway. He’d slept there a week earlier, the evening they went to see "American Sniper" together. She slipped past the picture of him and his best childhood friend on the wall, skirting the bed with the stuffed toy lamb — a baby shower relic — lying on top. Out the window, Golvach saw three people — two uniformed police officers and a woman wearing a shirt that read “chaplain.” Her chest pounded as she made her way to the front door and opened it. “Is it Spencer?” she asked. The second those words tumbled out of her mouth, she knew the answer, just as she had known when she uttered that exact phrase the day he was born, before anyone told her if the baby was a boy or a girl. She just knew. Spencer Golvach grew up in the sprawl of northwest Houston, surrounded by guitars and destined for a career in music, his father’s passion. When he turned 16 in 2005 and got his driver’s license, the easygoing musician started working at a local guitar store in a strip mall not far from Jersey Village High School, where he excelled in shop class and anything he could do with his hands. He had always fiddled with his dad’s guitars, and he developed a knack for fixing and rebuilding them at the store. A few years later, when the shop owner announced his retirement, Spencer decided to buy the Cy-Fair area business. 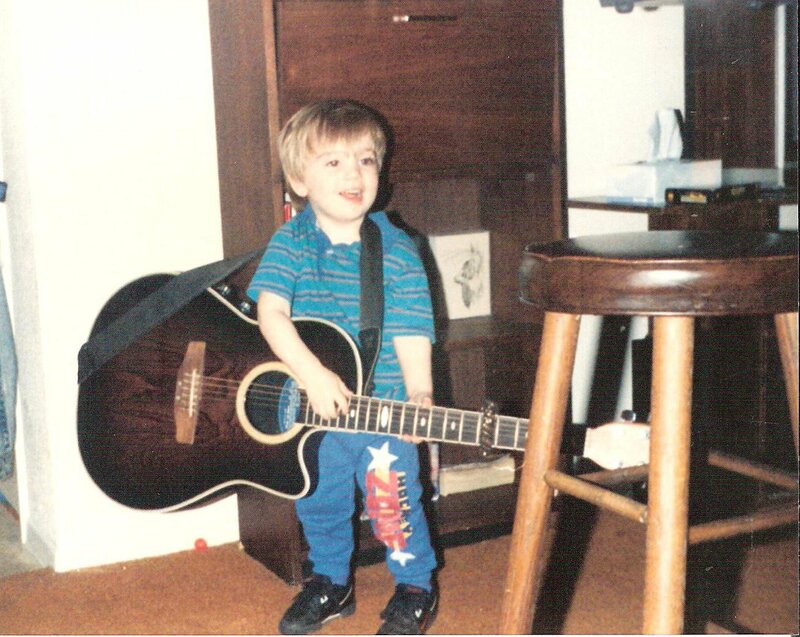 Spencer Golvach, at the age of three, pictured with a guitar. Authorities say Golvach was killed by Victor Reyes, an undocumented immigrant, during a random shooting spree in January 2015. With nine employees and a soft economy, life as an entrepreneur proved tough sledding. He struggled to turn a profit, and he took a second full-time job as a receiving lead and forklift operator at a local warehouse. Even that wasn’t enough to cover the bills. By early 2015, Spencer was preparing to move into a smaller — and cheaper — space in the same shopping mall. He could hardly wait for Saturday, Jan. 31 to arrive, the day the slimmed-down version of Spencer’s Guitar Shop was set to open. Between giving guitar lessons, working an 8-to-5 day job, building out the new store and playing bass in his band — The Dead Revolt — Spencer needed a break. Less than a mile from his apartment, Spencer steered into the left turn lane at 18th Street and Mangum Road and waited for the green light. The details of what happened next are captured in the records of two police agencies, more than a dozen news articles and the unceasing nightmares of Spencer’s parents and loved ones. An undocumented Mexican national named Victor Reyes, a native of Reynosa along the Texas-Mexico border, pulled up next to Spencer's beloved white Toyota pickup. He pointed a pistol at Spencer’s head and pulled the trigger. The bullet went through the passenger side window and into Spencer’s skull, at the top of his right ear. But the Golvach family’s suffering — compounded by the feeling that Spencer’s death could have been prevented — was just beginning. Houston police, their report indicates, found 25-year-old Spencer dead in his truck at 12:56 a.m. — right around the moment Julie Golvach, waving goodbye to her sister, couldn't shake the feeling that something was off. A few hours later, she was phoning her ex-husband to break the news. More than a thousand people attended Spencer’s memorial service, a tribute to his fun-loving nature and penchant for making friends across generational, ethnic and gender lines. Those who knew Spencer universally describe him as fun-loving and strikingly calm. After he died, a family friend ordered up a batch of commemorative rubber bracelets emblazoned with his laid-back motto: “Chill Don’t Freeze." More than once since the funeral, Julie Golvach has found herself wishing that her son’s attacker had gotten to know Spencer. She’s convinced he never would have pulled the trigger. But the official evidence of the crime, while scant, suggests Spencer was chosen randomly. And he wasn’t the only victim. Police say Reyes shot a man in the face, wounding him, in the suburban city of Jersey Village minutes before killing Spencer, and they connected him to at least two more random shootings shortly thereafter. All told, Reyes shot two dead and wounded three others before a Harris County Sheriff’s deputy took him down after a violent shootout, officials say. John Weston, 67, says he’s lucky to be alive after encountering Reyes on the Hempstead Highway near Pinemont, about 10 minutes north of where Spencer had just been killed. He remembers seeing a big, dark truck driving aggressively behind him. When he got to the stoplight, it pulled up alongside him. He pressed his foot to the accelerator to get out of the line of fire, but not soon enough. He heard the second shot, and its impact felt like someone “hauled off and hit you upside the head,” he said. Weston realized the truck's driver was the gunman. “I saw blood everywhere,” he said. His hands were covered in it, so he could only manage to re-dial on his cell phone. He finally reached his wife, who told him to go to the nearest toll booth. An ambulance was called. Doctors found that a bullet had entered his left cheek and stuck in the other side of his mouth. A year later, after reconstructive surgery to replace a badly shattered jaw, his mouth remains completely numb below the tongue. With his health woes and lost time at work, he’s struggling to keep his printing business afloat. Had Reyes been a homegrown criminal, the story might have ended in the empty field where the deputy shot him — chalked up as another random act of violence in a city and nation all too used to them. But as word spread about Reyes’ long criminal record and multiple deportations, the case was thrust into the volatile debate over illegal immigration and control of the southern border: first in local news stories, then at the Capitol in Austin and most recently on the presidential campaign trail — on a stage in mid-November with GOP presidential hopeful Donald Trump in Beaumont, where Dan Golvach spoke out and held up a poster of Spencer along with others killed by undocumented immigrants. According to the Houston office of Immigration and Customs Enforcement, Reyes had been removed from the country four times between 2003 and 2010, but little is publicly known about what he was doing in Houston prior to terrorizing its northwest environs — or why he did it. His criminal and illegal entry records stretch back at least to 2002 when, at age 18, he was convicted of burglarizing a building in Hidalgo County, across the border from Reynosa, which he told police was his place of birth. He spent a month and a half in jail before a state court sentenced him to three years' probation, ordered him to pay an $850 fine and mandated 120 hours of community service. 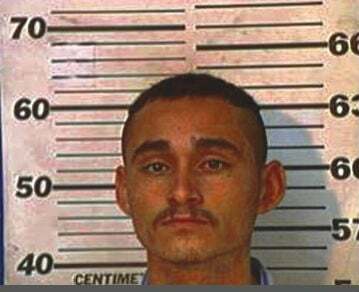 Victor Reyes, shown in 2001 jail mug shot from Hidalgo County. Authorities say Reyes, an undocumented immigrant, went on a January 2015 shooting spree in Harris County that killed two and wounded three. A year later, he was back in the Hidalgo County Jail for breaking a beer bottle over a man’s head at the Tejano Saloon in Pharr. He was sent back to Mexico after serving about a month in the local jail, but he came back. By then, his previous probation had been revoked, and he served several months in a state jail in Raymondville. Deported again on Jan. 20, 2004, Reyes was caught trying to cross the border the next day, triggering a 90-day sentence in federal prison and yet another deportation — his third. A few months later, on Aug. 10, he was caught again, in McAllen, and received a one-year federal prison sentence for his fourth known illegal re-entry. His crimes didn’t end there. A few weeks before his prison release date, Reyes beat up a fellow inmate — described by his lawyer as a rival gang member — cutting and fracturing his face, according to federal court records. Two new assault charges made Reyes eligible for 20 years behind bars. Despite his history of violence, burglary and repeat illegal crossings, federal prosecutors offered Reyes a deal: In exchange for a guilty plea on one of the counts, and in recognition of his “truthful testimony” and “acceptance of responsibility,” they promised to give him a sentence “at the lowest end of the applicable guidelines” on a single charge, court papers show. Under the plea bargain, Reyes' sentence was 63 months, a quarter of the maximum he faced under the two counts. That’s a few more spoonfuls of salt in the wound for Dan and Julie Golvach. Had Reyes been given even half of his possible sentence on the two assault counts, he would have been in prison instead of at that traffic light killing their son. The prosecutor who signed the plea agreement, Assistant U.S. Attorney Tim Hammer, declined to talk about the case, referring questions to U.S. Justice Department spokeswoman Angela Dodge in Houston. Dodge sent The Texas Tribune a boilerplate description of plea deals, saying they “ensure a resolution of the case and that someone is convicted of the crime(s) we believe they committed without going through the time and expense of a trial,” while providing “justice for all.” She declined to say whether prosecutors took Reyes' previous crimes into account, or if they frequently offer plea deals to convicted criminals who commit additional crimes behind bars. It’s another official secret in a case with no shortage of them. The Houston Police Department, using its own discretion under the Public Information Act, blocked release of all but a few details on the Golvach and Weston shootings. The department cited a provision allowing it to withhold criminal records absent a final disposition, such as a conviction or deferred adjudication. Since Reyes is dead and the city’s case is otherwise closed, that means Houston police likely can withhold the information indefinitely. The Harris County Sheriff’s Office declined to release its investigative files, but for an entirely different reason: After every officer-involved shooting — in this case, a deputy ended Reyes’ deadly rampage — the Harris County district attorney’s office presents the case to a grand jury even if no one complains. That happened last week, just days before the one-year anniversary of the shooting spree. The federal government holds onto its files with a tight grip, too, citing the 1974 U.S. Privacy Act. The act covers only U.S. citizens and lawful permanent residents, but Immigration and Customs Enforcement has decreed that its protections apply to federal immigration detention records, even those related to undocumented immigrants convicted of horrific crimes. The agency voluntarily released a narrative of its multiple encounters with Reyes, but the Tribune has not yet heard back from ICE or U.S. Citizenship & Immigration Services on its written request for his entire immigration file. The secrecy across local and federal agencies that came into contact with Reyes confounded and frustrated the people touched by his violence. Weston said his wife became “very disillusioned” about their quest for even the simplest answers. Dan Golvach, father of Spencer Golvach, in Houston Tuesday, October 20, 2015 at the intersection where his son was killed by an undocumented immigrant in January. Hoping to break through the bureaucratic walls and get some answers about who killed their son and why, the Golvaches eventually hired a former investigative reporter, ex-KTRK-TV newsman Wayne Dolcefino. In a letter last year to then-Harris County Sheriff Adrian Garcia, Dolcefino said the sheriff’s office was “doing a disservice to this crime victim by not responding to this request in a proper manner.” The local investigative files remained sealed as of late last week, but the Harris County Sheriff's Office asked the Tribune to resubmit its request for the records and promised a quick turnaround. Even with new information beginning to trickle out, the victims and their families still don't know where Reyes lived or if he had a job, who owned the truck he was driving that night or — least of all — the motive for his deadly rampage. According to Harris County Assistant District Attorney Heyward Carter, some elements of the senseless crime may never be known. Carter, who handled a single aspect of the case — the officer-involved shooting — was able to speak about the case for the first time last week. He revealed that Reyes was "extremely intoxicated" and had a "significant amount of cocaine" in his system. He also identified the weapon, a .380 caliber pistol, that he said was legally purchased at one point, but authorities haven't determined how a convicted felon and undocumented immigrant, barred from buying or possessing firearms, obtained it. “We live in an age of mass shootings, and even though this one didn’t get a whole lot of publicity, that’s what this is." Carter also provided details about the actions of the Harris County deputy sheriff, Javier Rojas, who finally put an end to the deadly rampage. By chance, Rojas was patrolling the area and heard shots being fired. He saw the truck of Reyes' final victim, identified by police as Juan Garcia, in obvious distress, weaving randomly at an intersection. Garcia later died from his wounds, and a woman in the car with him was slightly injured from the broken glass. Rojas chased after Reyes, who crashed his truck through a barrier at the end of a dead end street and went another 200 yards or so into an empty field. Rojas continued the pursuit on foot and found Reyes crouching behind the truck. He ordered the suspect to drop his weapon but Reyes stood and fired at the officer instead. Rojas returned fire and struck him in the chest. When authorities photographed the body his hand was still gripping the pistol "with his finger on the trigger," Carter said. In terms of a motive, authorities can only speculate based on a conversation Reyes had with a supposed girlfriend about three hours before the shooting spree began. He wanted her to go out to a bar or nightclub with him, and she turned him down. Authorities speculate he may have been taking out his rage on couples: It's possible he saw Spencer Golvach dropping off his girlfriend shortly before shooting him at the red light and then targeted Garcia after seeing he had a woman in his vehicle. Carter did confirm what the families had learned from detectives in the immediate aftermath of the shootings: Reyes still had plenty of ammunition left in his truck — suggesting that he was planning a more extensive shooting spree. There were at least 20 live rounds left in the vehicle, and he appeared to be reloading while driving near the scene of his final attack. After the facts were presented to grand jury last Wednesday, the panel decided not to proceed with any further action related to the incident. The Golvach family calls Rojas' response heroic. "Why was he allowed to be here?" Julie Golvach burst out into tears again last week after hearing for the first time some of the details of the crime that took her son's life. It’s a common refrain among those who have been victimized by people in the country illegally. They weren’t supposed to be here in the first place, and the government's inability to keep them from crossing the southern border after they’ve been deported — and prevent them from committing crimes — provokes a unique brand of helplessness and outrage. Even Weston, a lifelong Democrat who attended both of Barack Obama’s inaugurations and favors allowing otherwise law-abiding immigrants into the United States to work and seek a better life, said he had to fight the urge to call Donald Trump and tell him he was “dead-on” with his focus on foreigners who commit crimes here. “Somebody’s got to do something about it,” he said. In the same breath, Weston emphasized that he doesn’t support Trump for president and said keeping dangerous felons from crossing the border or entering the vast illegal workforce defied simplistic solutions. Dan Golvach is more blunt and outspoken. 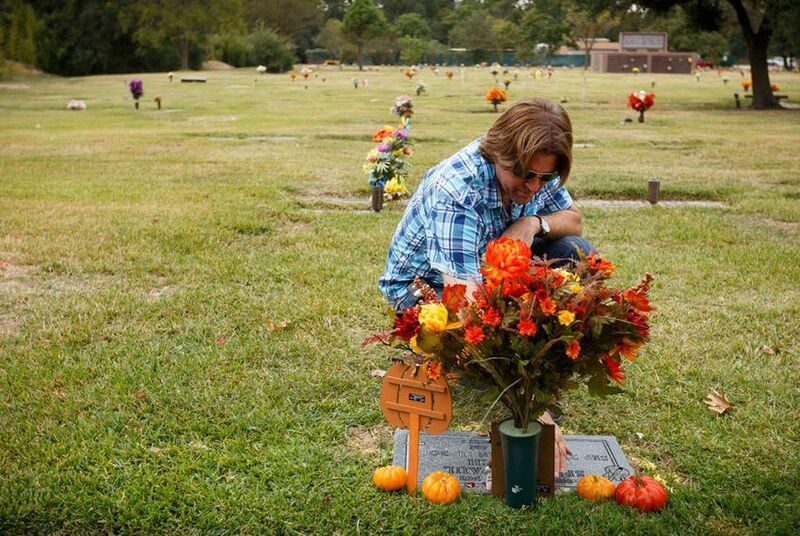 A few weeks after his son’s murder, he was at the state Capitol testifying in favor of 2015 state legislation — ultimately doomed — that would have prohibited local law enforcement authorities in Texas from adopting “sanctuary” policies that keep police out of immigration matters. Then late last year, he appeared with Trump at a campaign rally in Beaumont, saying his son died as “the result of politically correct politics” — namely, bipartisan policies that he believes go too easy on undocumented immigrants and the people who hire them. Golvach readily admits that anger over his son’s killing sometimes hits “toxic” levels. He says he’s still haunted by the image of Spencer in a hastily chosen coffin, still upset he was killed right next to the stadium where he used to watch baseball as a kid, still mad as hell that the government won’t cough up the records they have on his son’s killer.